Northampton produced a battling display to beat Ulster 23-13 at stadium:mk and book a Heineken Cup semi-final showdown with Perpignan. Scrum-half Lee Dickson struck with the decisive try midway through the second-half to see off a determined Ulster side and propel the Saints into the final four for the third time. A stadium record 21,309 fans packed into Northampton's temporary home to watch the hosts slowly squeeze the life out of the visitors in scorching temperatures and they will return later this month for the visit of the Catalan giants. Prop Soane Tonga'uiha crossed for the game's first score to put Northampton in control but Ulster rallied, with a try from Andrew Trimble and the boot of Ian Humphreys carrying them into a half-time lead. Northampton playmaker Stephen Myler, who finished with 13 points, booted his side back into the contest before Dickson pounced for what proved to be the match-winning try. In what would prove to be a telling statement of intent, a powerful drive from the kick off laid the foundation for Northampton's first raid, with Trimble failing to claim a Myler clearance and gifting the Saints an attacking scrum deep inside their rivals' 22. A free kick then saw No.8 Roger Wilson tap and go before centre James Downey was wrapped up in midfield, with Tonga'uiha eventually barrelling over for the game's opening try. Myler was on target with the conversion but Ulster countered and a penalty at the next scrum allowed Humphreys to put the Magners League high-flyers on the board from the kicking tee. Back came Northampton with an inside pass from wing Chris Ashton putting Downey away only for a knock on to serve as a major let off for a stretched Ulster defence. The visitors had some dangerous-looking strike runners of their own, with Trimble and centre Nevin Spence combining well before Humphreys created an opening for wing Simon Danielli. The Scotland international raced away for a try only to be called back for a forward pass. Saints were made to pay for their indiscipline up front with Humphreys slotting his second long range effort on the quarter hour. But the Northampton pack atoned for their error with another ominous drive into the Ulster 22 only for lock Courtney Lawes to fumble the ball in sight of the line. It was a rare error in what was otherwise a worthy Man of the Match performance from a player determined to reclaim his England berth. A kicking exchange offered both sides a little relief before Lawes and lock partner Christian Day rumbled close, but a forward pass to prop Brian Mujati saw the move come to an end. As tempers began to fray, Myler had the chance to take the sting out of the situation with his first penalty attempt but saw his relatively straightforward chance sail wide of the posts. Ulster were not so wasteful, with centre Paddy Wallace putting Danielli through with a well-timed inside pass moments later, and while he was thwarted there was no stopping his fellow wing Trimble, who skipped through to dot down under the posts. Humphreys' conversion put the Irish side firmly in control of the game and gave their large travelling support plenty of reason to cheer. Myler's boot continued to mis-fire with a kick ahead bouncing dead in-goal, whereas the bounce went Ulster's way when Humphreys attempted to take the game back into Northampton's 22. The Saints eventually cleared the danger with a kick and chase from fullback Ben Foden forcing an error from Humphreys in the shadow of his own posts. Northampton won a penalty at the resulting scrum and Myler rediscovered his scoring touch with the last act of the half. Northampton's handling continued to let them down at the start of the second period and when they did manage to hold onto the ball they found their path blocked by a committed Ulster defence. But Saints clawed their way back onto level terms when Myler slotted a penalty after Ulster lock Dan Tuohy was penalised for not releasing Mujati in the tackle. The boot played an increasing role as the game wore on but Saints were back at their fleet-footed best as the final quarter approached. Ashton and Foden combined brilliantly down the touchline and when the latter was hauled down inside the 22, centre Jon Clarke recycled the ball before feeding Dickson for a simple score, converted by Myler. Humphreys immediately set about reducing the deficit by carving a great line through the Northampton defence and flanker Chris Henry was hauled down just short of the line. The Ulstermen continued to press with Humphreys involved again and a quick penalty had Northampton at breaking point only for fullback Adam D'Arcy to spill the ball with the line at his mercy. The game was still very much in the balance when the Saints' scrum came up with another timely effort to earn a penalty, which Myler slotted to take him through the 1,000 points barrier in Northampton colours. However, he failed to give his side a little more breathing room a few moments later after Ulster flanker Robbie Diack drifted offside. Northampton raised the tempo in the hope of crushing the impressive Ulster spirit and some quick hands put wing Paul Diggin into space only for play to be called back for a forward pass. 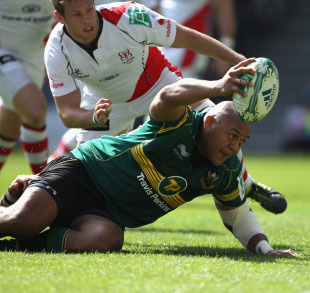 A gutsy Ulster continued to go toe-to-toe with their hosts and forced Northampton back into their own half in the closing stages only to have the door slammed shut by a Saints side determined to go one better than last season. The clock continued to work against the visitors and when Henry was penalised for holding on with two minutes left on the clock, Ulster's hopes were finally extinguished. As a result it is Northampton who progress from this battle of former champions to keep their hopes of repeating their 2000 triumph very much alive.